Liverpool finally look like genuine title contenders and despite the fact that the goalless draw with Manchester United ended their four-match winning run, the Reds head into the West Brom game full of confidence. The Baggies have done really well of late, taking six points from last four fixtures, but we seriously doubt they can match red-hot Reds, and you should, therefore, know that Coral has enhanced the price on home win to whopping 25/1 for new customers over the age of 18. 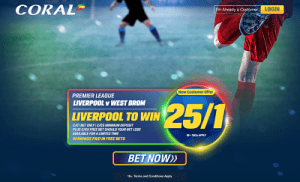 All you have to do is register with Coral through this link and place your first wager on Liverpool to Win – 25/1 in My Markets. If you do that and the Reds win, extra returns will be added to your account as free bets. Terms and conditions apply.